It’s been so long since I’ve posted on this topic, I have no reservations about plagiarizing the lead I used for Offbeat and Quirky, posted way back in March of 2013. I like the word quirky, which describes quite a few of my photos. It’s kind of an odd word, with a number of definitions, depending on the source. Most apply to people, but according to vocabulary.com, it can also be used to describe things or events that have ‘an unexpected and unconventional element.’ That’s the sense in which I think it applies to my photos. 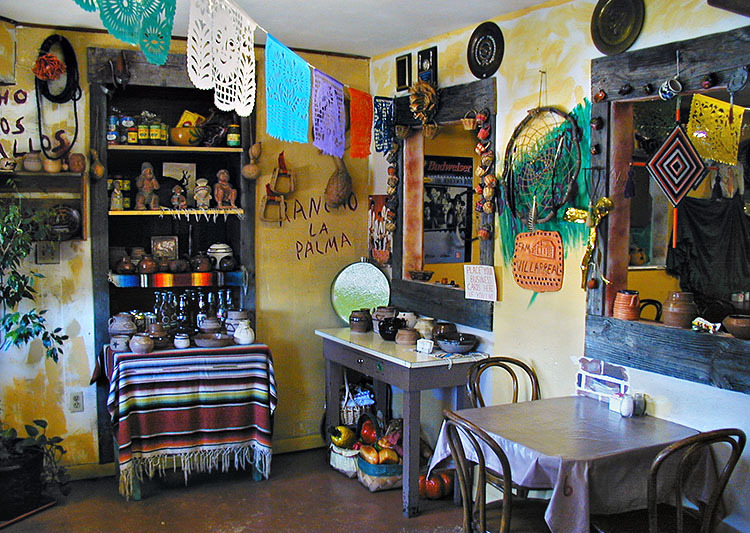 When I first started in digital photography I was attracted to subjects that were strange, surprising, and humorous. 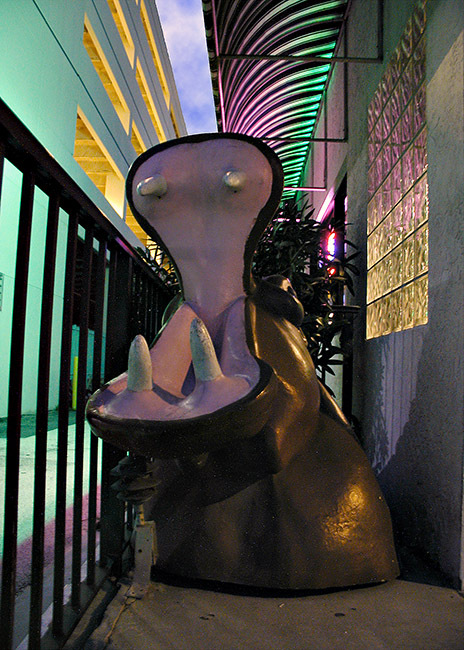 And in those days I lived within a few minutes of some very quirky places, like Orlando’s International Drive. 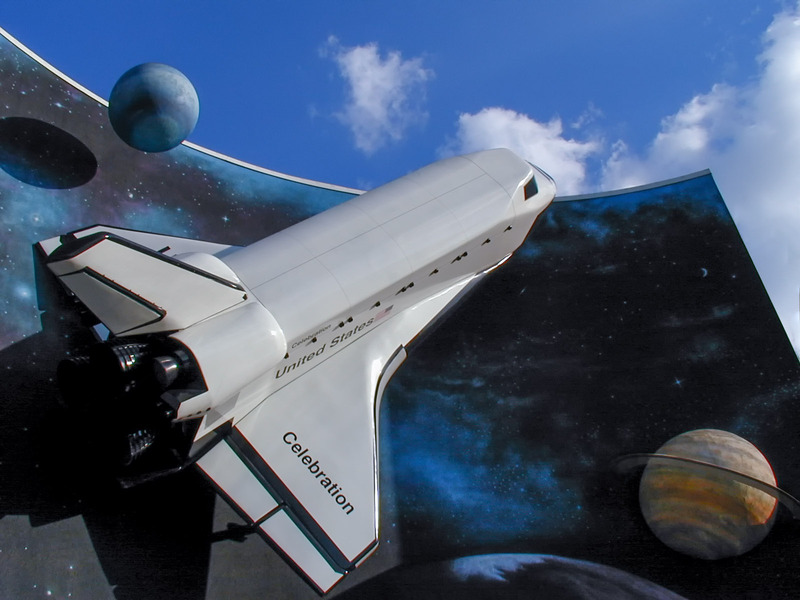 All the photos in that post are from those early days in Orlando – and I have to tell you I’ve never had more fun with photography! So I hope that comes through in this second installment of my little world of oddities. 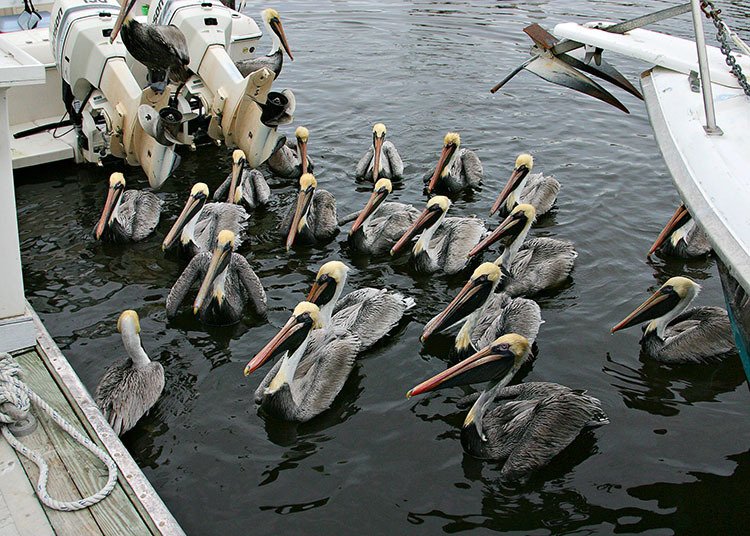 I’m going to stay in Florida but branch out to include human and animal characters – animate and inanimate – from Key West in the South all the way to Fernandina Beach in the far North. By the way, the last two photos feature an explicit word that some may find offensive. So if you would rather not have it displayed on your screen, stop when you get to the warning. The rest of the images are definitely safe for work. Oh, wait, here’s why it was there! These sparkling young women from Wisconsin saw me photographing the hippo and asked if I’d take their picture. Of course I said yes, and they quickly hopped on the hippo and struck this spontaneous pose. Then, just as quickly, they were gone, chatting and laughing. They’ve probably graduated from college by now . . . so a belated thank you, young women, for allowing me to participate in such a delightful moment of carefree exuberance! I’d send you each a print if I knew where to reach you. 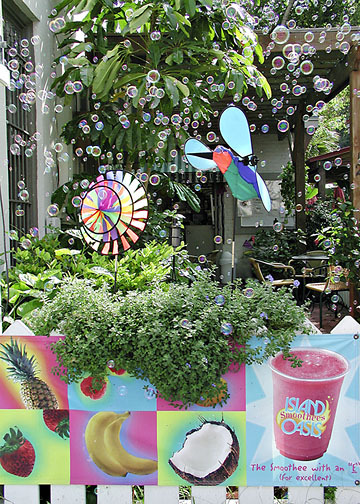 And there was the smoothie shop in Fernandina Beach, also taken in 2000. This one always makes me smile. 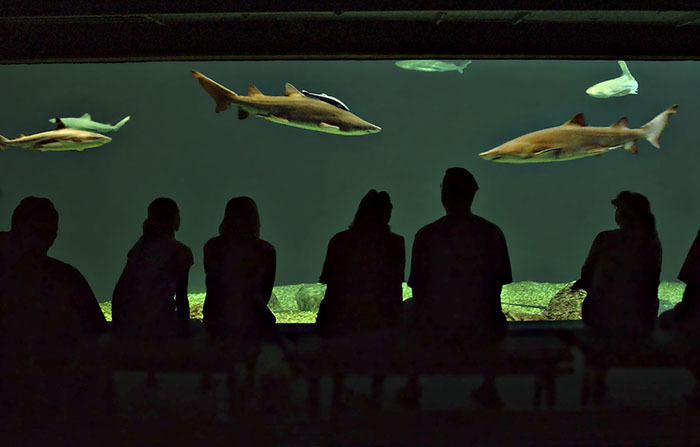 And how about those silhouettes watching the sharks at the Florida Aquarium in Tampa? 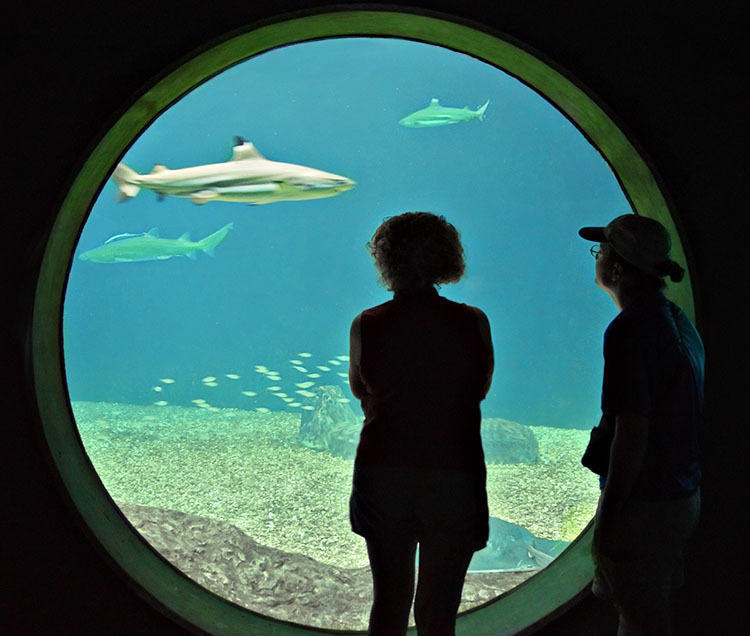 Also at the Florida Aquarium. That’s my wife, Barbara, on the left. 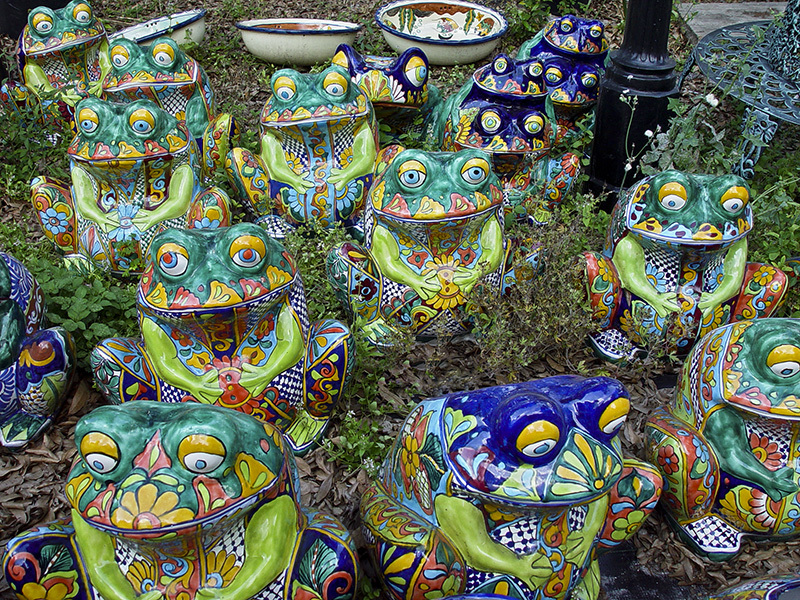 Also these characters at a flea market outside of Deland. 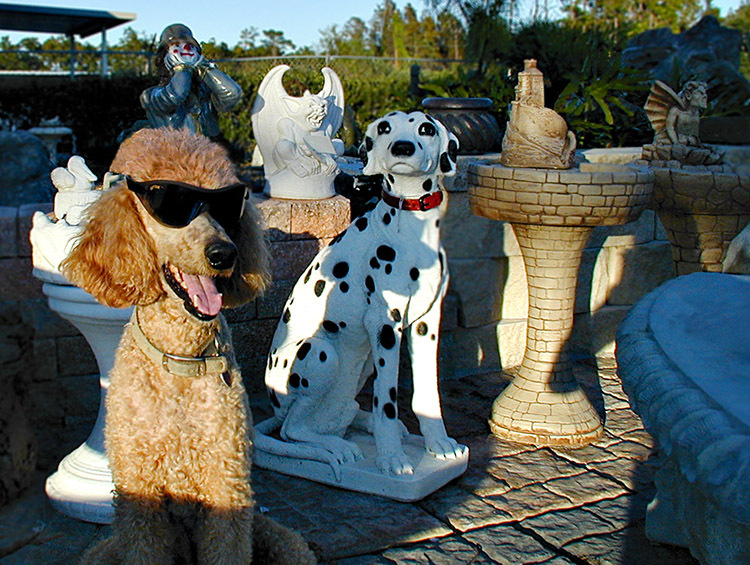 While we’re on the subject of lawn statuary, here’s Mr. Red, my canine companion of ten years, smiling at the irony. He was a good sport, very patient with me! 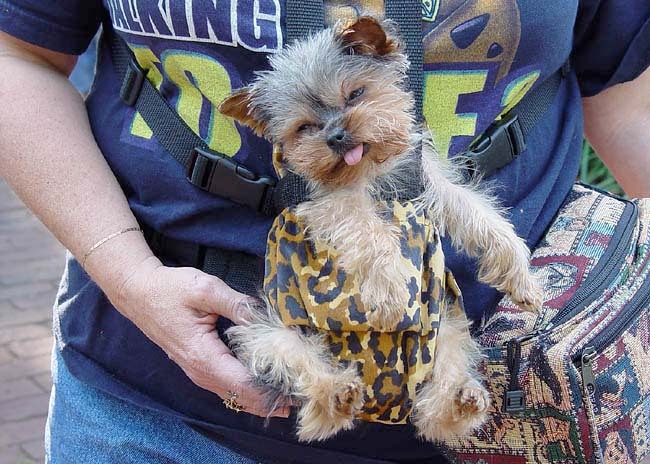 And this doggie, mugging for the camera at a sidewalk art festival in Orlando. The lady was selling those papooses. 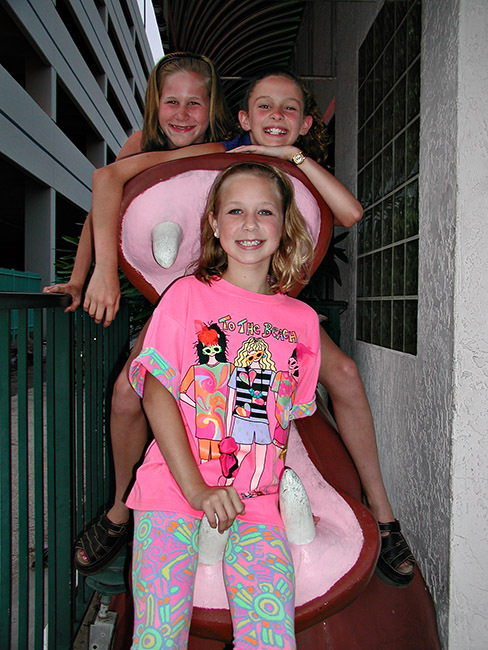 Fernandina Beach, 2003. One of my personal favorites. Nesting cormorants on Lake Eola, in downtown Orlando. 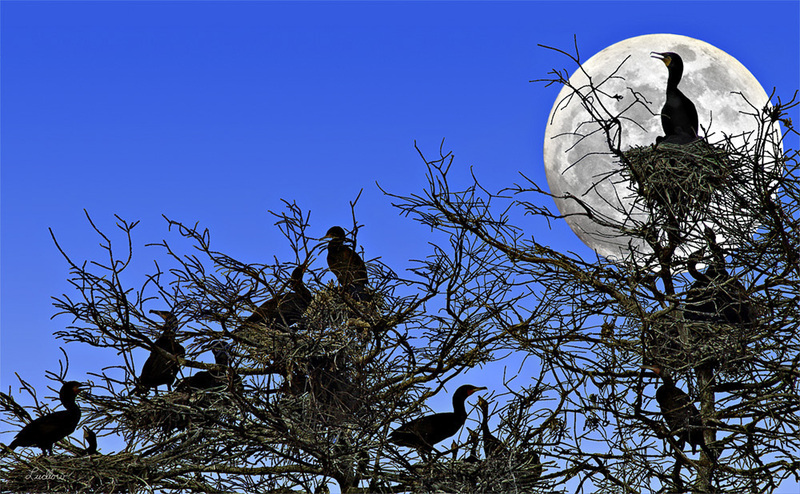 The photo of the birds was taken in daylight, and the dark blue sky and moon were added in Photoshop. Viera, Florida, near Melbourne, 2000. As long as we’re looking at large birds, how about Sandhill cranes? 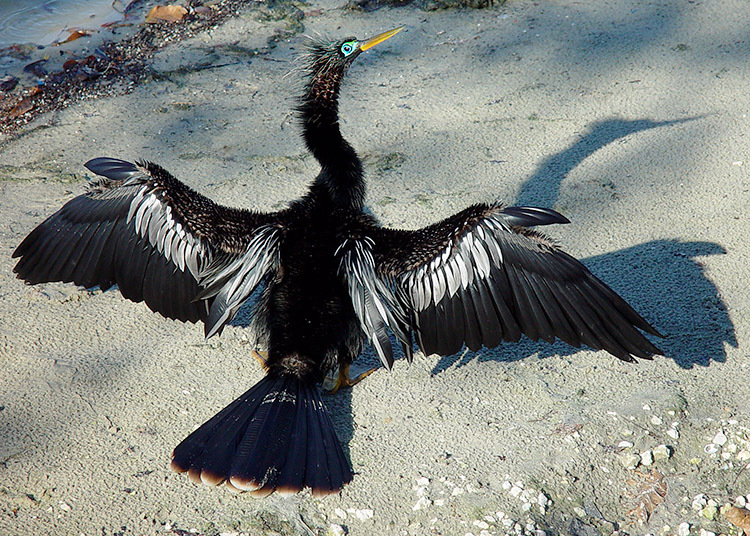 Did you know they can reach a height of four feet? You can read the Wikipedia entry here: http://en.wikipedia.org/wiki/Sandhill_Crane. 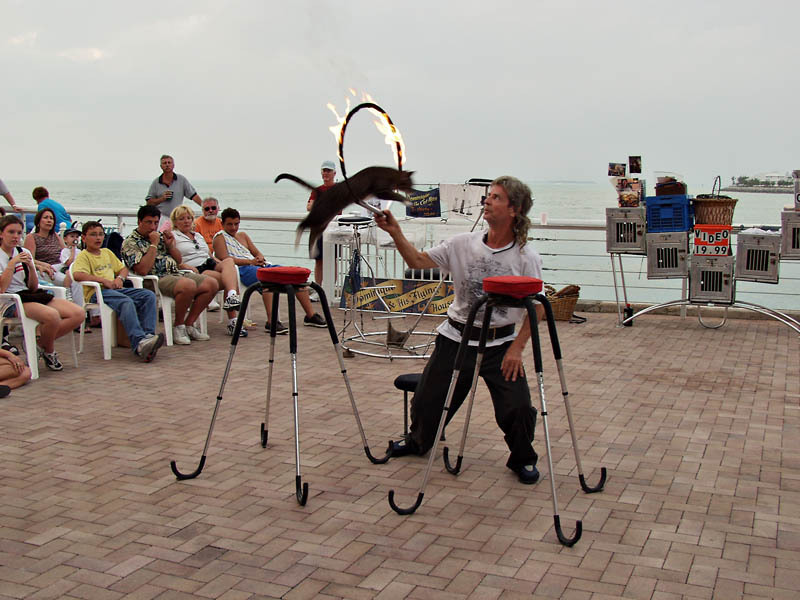 No collection of oddities is complete without a house cat jumping through a flaming hoop. Every photographer needs one of these in their portfolio! 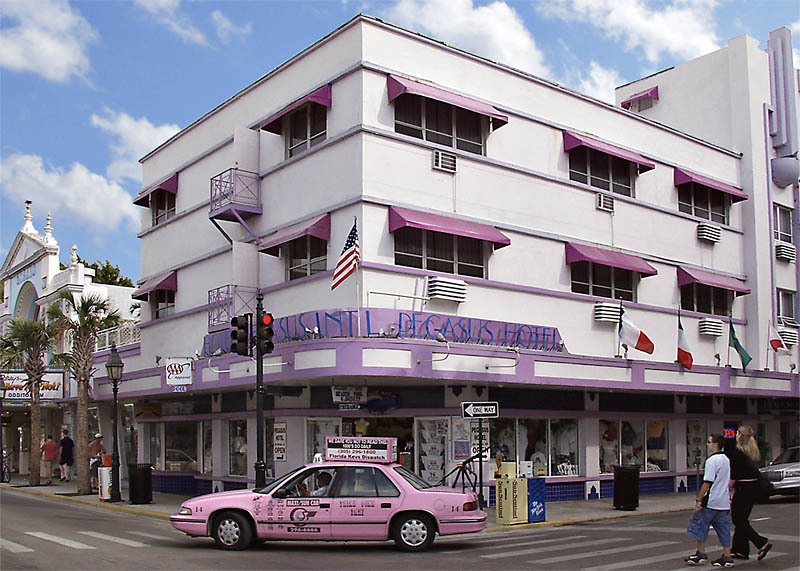 An art deco hotel and a matching taxi in Key West. Perfect timing, don’t you think? 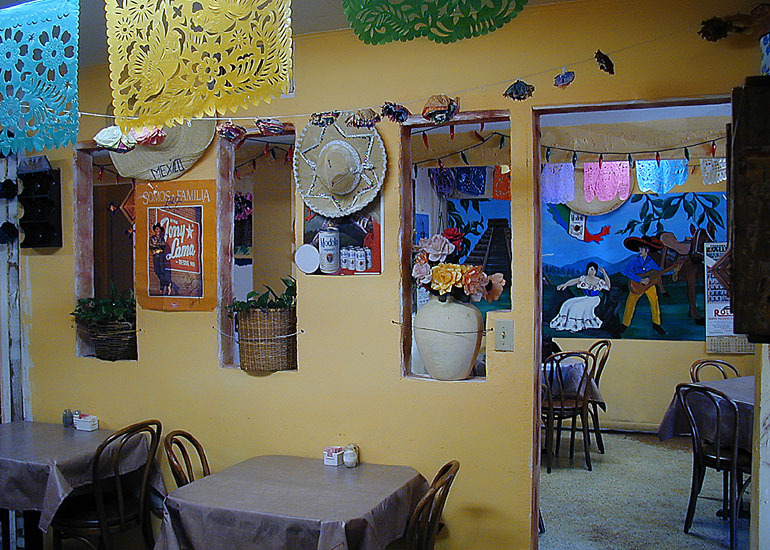 Mexican restaurant in Winter Haven, 1999. All I remember is that this was the upper portion of the facade of a retail store somewhere on Orlando’s International Drive. Some minor Photoshopping on this one. THE NEXT TWO PHOTOS CONTAIN AN EXPLICIT WORD THAT SOME MAY FIND OFFENSIVE. This strange d00d and his girlfriend were strolling through one of Orlando’s largest malls. I happened to have my camera with me and decided on a whim to document his rather blatant violation of community standards. I’ve never seen anything like that in public, before or since. Which is not to say I think such words should offend people – especially not that one, which has to be one of the most widely used adjectives in the English language! But the fact is it does offend many, and even folks who are not shocked may be uncomfortable when vulgar words are written or spoken in their presence at the wrong time or place. This guy, for whatever reasons, chose to flout the norms and flaunt his message in a manner that was bound to cause some people to cringe. By the way, I have no idea what, if anything, was on the front of his T-shirt, but the way the lady is looking at him makes me wonder. Checking out a line of fine clothing in an upscale department store. I should have asked him why he was displaying that message. I’m sure his explanation would have made my blog more interesting. Next time I’ll be bolder. As long as I’m plagiarizing, maybe I’ll do a book titled Humans of the Malls.